'Out of the Blue' is a former estate cottage, which has been lovingly restored and given a new lease of life. Situated in the picturesque village of Fowey, designated an area of outstanding natural beauty, the cottage gives easy access to all Fowey has to offer. With its winding streets, traditional houses, colourful cottages and its literary and maritime history from Pirates to twenty first century cruise ships, Fowey has something for everyone to enjoy-quaint gift and antique shops, kayaking for the more adventurous, leisurely river cruises, numerous walks from the doorstep, crabbing and fishing from the slipway or simply watching the world go by from the window. As a family of 4, with 2 teenage daughters, we have been visiting and holidaying in Fowey for years and have at last taken the plunge and bought our own property. 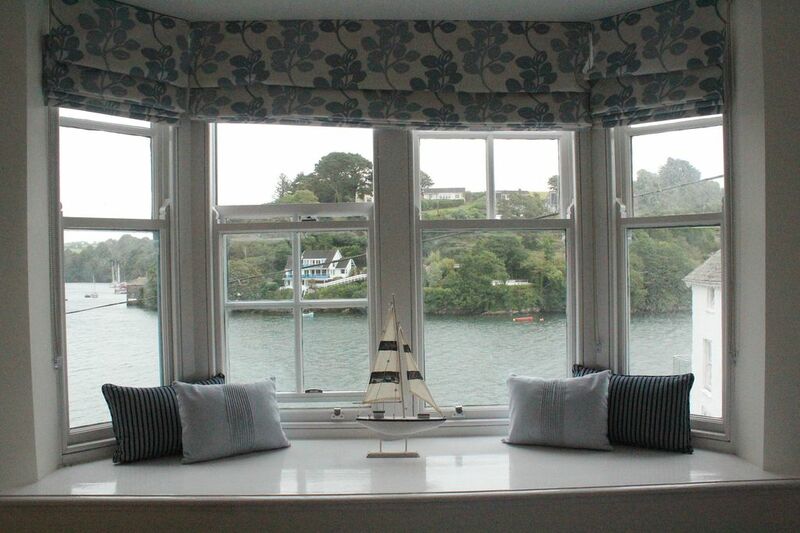 Hopefully, staying in our cottage will make you fall in love with Fowey as well! Located on the ground floor, the bathroom has a bath with overhead shower. Underfloor heating for your comfort. Lounge/dining area with two 2 seater sofas, dining table to seat four, TV with Freesat HD, Blue ray DVD player, Ipod dock and unlimited Wifi. Multi fuel log burner. Open plan fitted kitchen area with fan assisted oven, gas hob, dishwasher, microwave and fridge. Iron and ironing board also provided along with a highchair should it be required. Sit out on the front terrace and watch the boats go by. There are numerous golf courses in the area, from St. Mellion championship course, just over 45 minutes away, to Carlyon Bay just 10 minutes away. Notes on accommodation: With a cosy cottage atmosphere we have tried to create a comfortable home from home environment. Due to its elevated location, from a short flight of steps, bustling river views can be enjoyed from both ground and first floor. We have provided a seating area on the front balcony for your enjoyment. Please note that Out of the Blue is a non smoking cottage and does not accept pets. Outside: There is a garden to the property, which is due to undergo a full landscaping project so is currently out of bounds. We have a small open yard at the rear with a washing line and barbecue, to the front of the cottage is a small balcony with seating to enjoy the view from. Utility Room: Washing machine/tumble dryer. Cleaning / Towels / Linen / Maid service: All linen and house towels are included but please provide your own beach towels. The property is cleaned at the beginning and end of your stay, should your booking be for more than one week extra arrangements can be made. My partner and I and our 1 year old recently stayed at Out of the Blue with my sister and the house was perfect for us. I have stayed in Fowey many times in the past and this was one of the best places we have stayed for comfort, cleanliness and convenience. I love the end of town where the house is, I've stayed in the centre of town before and this was so much quieter and relaxing and so convenient having the car park a stones throw away. The view from the lounge and master bedroom is lovely, I had a great afternoon sat with a glass of wine watching the car ferry. The decor is of a very high standard and the kitchen is very well equipped. I advise people to take some coffee pods with them so they can make use of the coffee machine as we hadn't realised there was one which would have been nice to use. I definitely recommend this lovely house to a small family or couples. Readymoney Cove is the nearest, sheltered, sandy beach, which is a short 15 minute stroll away. The nearest airport is Newquay, approximately 45 minutes away. The nearest railway station is at Par approx 5 miles away. Fowey has a delightful village atmosphere with many good quality restaurants and pubs. There are banks (including ATMs), an artisan bakery, butchers/deli, fishmonger, wine merchant, book shops, small supermarket (with a sub-Post Office) and several clothes and specialist shops. There are also two sailing clubs, a chandlers, and quirky gift and antique shops to browse in. Take the passenger water taxi to nearby Polruan or the car ferry to Boddinnick, visiting the Ferryside, the former home of Daphne Dumarier. Regular cruises also run from the harbour to nearby Mevagissey. Several river kayak expeditions or self hire companies are also within a few moments walk from the cottage.